Whether you are seeking laser engraving, laser cutting, small part machining, contract manufacturing or another CNC machining service, precision makes all the difference! If you want perfection then there are some areas you should consider when selecting a precision CNC machine shop. A quality machining center will be able to accommodate all degrees of tolerances to achieve accuracy and precision. Small part machining, for example, requires extremely close tolerances. 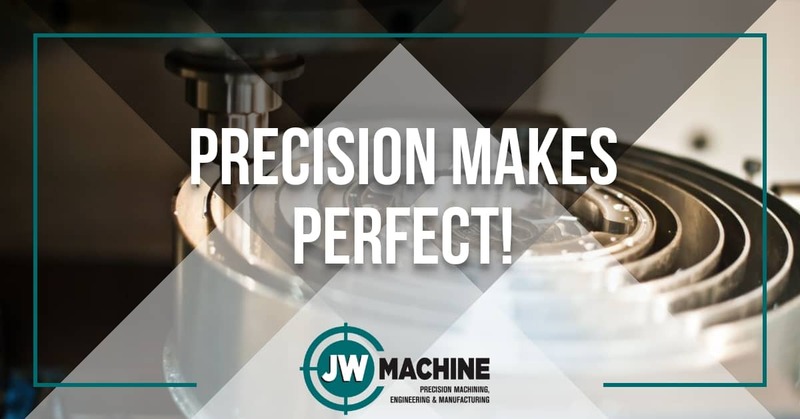 JW Machine ensures all of our machining centers are properly maintained, calibrated and capable of accommodating whatever tolerance is needed to get the job done right. It is important for a CNC machine shop to have precision CNC machining equipment, tooling and staff capable of handling all types of materials. Using an exotic material in a machine that is not designed for that material OR assigning inexperienced staff to work with it will likely result in an end product that is not precise or exact. JW Machine has the highest quality machine shop equipment operated by experienced staff. Precision CNC machining should be performed in a climate controlled environment. This is especially important for small part machining that requires close tolerances. A variation in temperature can cause materials to expand or contract and will negatively affect the outcome. JW Machine is a climate controlled precision CNC machine shop. Remember, precision equals perfection, and you should settle for nothing less. Don’t just pick any company that comes up when you type “CNC machinist near me” in the search bar. You still need to do your homework. JW Machine stands ready to deliver your precision CNC machining project to exact specifications. Call or come by to learn more about the JW Machine difference.